There’s maybe a zillion computer issues out there which are so damn weird that most people scratch their head in misbelief. One of these weirdnesses just crossed my way a few days ago. It all started with a very simple task: One of my engineers had to renew an SSL certificate for an IIS-hosted website. After receiving the renewed SSL certificate and importing it into the certificate store, he tried to bind the SSL port on the IIS website with the new certificate. All investigation about this issue were dead ends. Sure, there is a lot of information about this issue available on the net. There’s even the official KB981506 at Microsoft which tries to fix this for IIS 7 through a hotfix. As with other possible solutions out there, there’s people for whom this worked, while it didn’t for others. Neither did it for us. To make this even more worse: Using the very same private key/certificate pair on another server worked perfectly! So, with all that information I thought about the export/import way being well worth another try – using a slight variation. This takes also into account that the MSDN article mentioned above states the possibility of a wrong “key usage” token. Therefore I made sure that I got a proper export from Certificate Manager into PKCS#12 (.pfx or .p12 extensions) including both the private key and the certificate for both the renewed and the previous period. Besides some rather to be ignored differences, the most notable and even as important one are the “X509v3 Key Usage” tokens, as they differ for the both key/cert pairs. While the key usage 10 (should read 0x10) denotes an encipherment-elligible certificate, a key usage of 80 for the renewed certificate denotes it as valid for signing purposes only. This however makes not much sense, as it should be encipherment-elligible, otherwise our TLS/SSL won’t work at all. Maybe this is the root cause of the certificate, which could not be properly used for TLS/SSL port binding on IIS? So we obviously had a mismatch between the X.509 default and the respective extended attributes. I got the feeling, that the MSDN article was indeed right about the “mismatch” reason. Especially if digging around the X.509 RFC, which stated some special considerations about when and how particular usage key tokens apply. Basically to say is that conflicting values between the default and the extended key usage attributes may render a certificate useless in some cases, as they the flags are ignored in some cases. So in this case I suppose that due to a somehow wrong default key usage attribute the certificate was still valid, but it was not elligible for envipherment use as the attributes mismatched each other. Obviously this caused the default key usage attribute to be fixed up in some way. After importing the reconverted PKCS#12 file into Cert Manager, rebinding port 443 with the new certificate worked properly and SSL was usable from that point on. To conclude from my experience: The root cause for this was a most-likely malformed default key usage attribute, which didn’t match up to the extended key usage attributes. As to my understanding, it may or may not be a software bug in IIS 7 on Windows Server 2008, which messed up binding the certificate to the port because it couldn’t handle this situation properly. It is however unknown, why the hotfix didn’t work and it must be assumed, that my case does not really apply to the KB issue. As seen from the import on a Windows Server 2008 R2 host with IIS 7.5, the renewed certificate DID work properly there, even without tampering around with openssl conversion in the first. This might be due to a proper implementation which demands that the extended attributes are preferred over the default attributes. Additionally, the successful export+openssl-conversion+reimport seems to support this assumption, as it did work afterwards on the Windows 2008 / IIS 7 host. Here we must also consider that openssl did remove the default key usage attribute upon reconversion to PKCS#12 format. This sounds crazy but I had the same issue so I renamed the pfx file on the server and copied the “same” pfx file from another server and it worked. Don’t know what happened in the first copy. Very strange. I had this exact problem. Fixed it by not importing the certificate from a unc share, but copying it to a server drive. Also made sure the tick was set on the “Allow this certificate to be exported”. However – maybe it was the restart of the server after importing the certificate the first time. 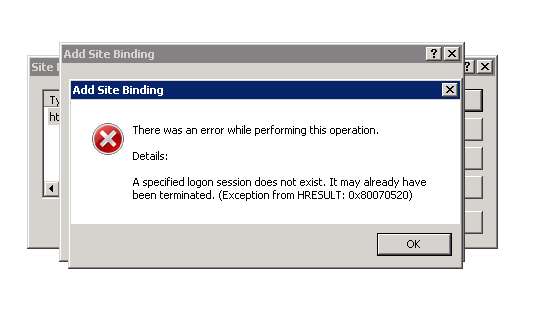 I had this same error message in IIS 7 when trying to bind to a newly installed certificate. I clicked “view” button from the binding edit window next to the drop down list with my certificate selected. All the certificate details were displayed and the certificate status was “This certificate is OK.” After I closed the view dialog box I was able to save the binding with no error and the certificate worked. I had a similar issue. And all the searches were not heading till we found this article. We managed to resolve the issue based on the recommended steps. As another mentioned. Importing from an UNC share was giving this error for us. So, we just copied it locally to the box first and then imported – it worked! James’ fix worked for me on a Server 2012 box. Thanks.